Step 2: If you're on campus click the first option which says "On Campus Click Here". If you're off campus, click the big blue "Go" button. Important Note: You must re-register annually, so try to remember the date that you initially registered. New York Times in Education is a supplementary resource for college instructors. 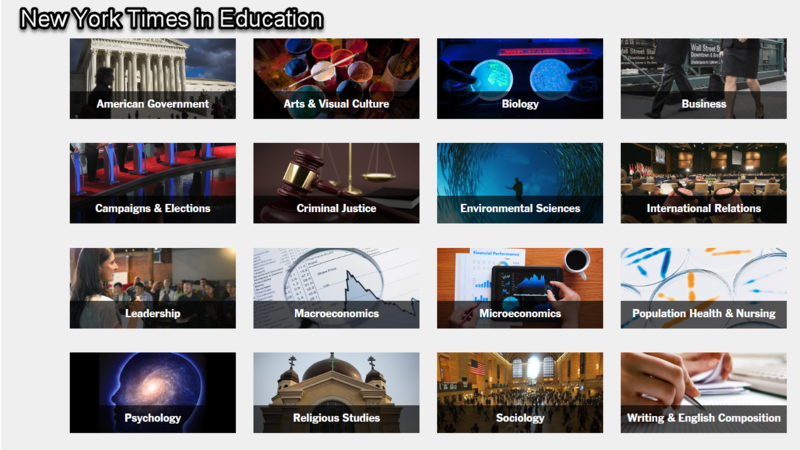 This is curated content, covering 16 disciplines, tailored to college level pedagogy. It's good stuff. Access requires a separate login. Step 1: Go to http://nytimesineducation.com/register/ and fill out relevant content. You must use your @tncc or @email.vccs.edu email when registering. Step 2: Once registered, faculty and students will go to http://nytimesineducation.com/ to log in. All of the links: New York Times, New York Times in Education and New Times Historical are included in the library database list. Again, it is essential that faculty and students first register in order to gain access.